If you're seeking gift inspiration for the visual thinkers, the doodlers, the do-ers, the design aficionados in your life, may we be of some assistance? Lo, Scriberia presents its annual gift guide, featuring all the stuff we'd love to find stuffed in our own stockings. Rachel Ignotofsky describes herself as a designer and illustrator with a passion for making information accessible and fun. She's a kindred Scriberian spirit if ever we saw one. This Christmas she has a host of beautifully illustrated books, designed to give young girls a different perspective on their world; by highlighting the heroines who have conquered traditionally male-dominated fields. They include Women in Sports: 50 fearless athletes who played to win and Women in Science: 50 fearless pioneers who changed the world. With Good Night Stories for Rebel Girls also riding high in the bestseller lists, it looks like 2017 is the year that literature for a new generation of feminists came of age. In case you missed it, last Christmas, Scriberia's creative director, Dan, wrote a Top 5 Christmas Stamps post, outing himself as a philatelist of a certain vintage. In it, he made special mention of these beautiful Christmas seals, by Danish designer Erik Petersen in 1962. Though technically festive, the original, mint condition sheets, available from the ever brilliant Present & Correct, will look fantastic framed, all year round. What we love about this stuff is that it makes inventors of us all. These little packs of mouldable glue turn the chore of mending broken objects, or modifying them to suit our needs, into a strangely addictive game. We recently captured the story behind the product in a comic, and became instant converts to the cult of Sugru. Check out #mysugrufix for inspirational hacks. Alumni of our hardworking picture workshops will know that drawing every day - even just a little bit - can make a huge difference to the way you think and express your ideas in pictures. So, to help you master a daily drawing habit, why not request one of these classic Leuchtturm1917 notepads, which can be personalised, and customised with the option of plain or dot-matrix paper, perfect for keeping orderly sketchnotes. Another way to your doodle-a-day could come with your morning cuppa. 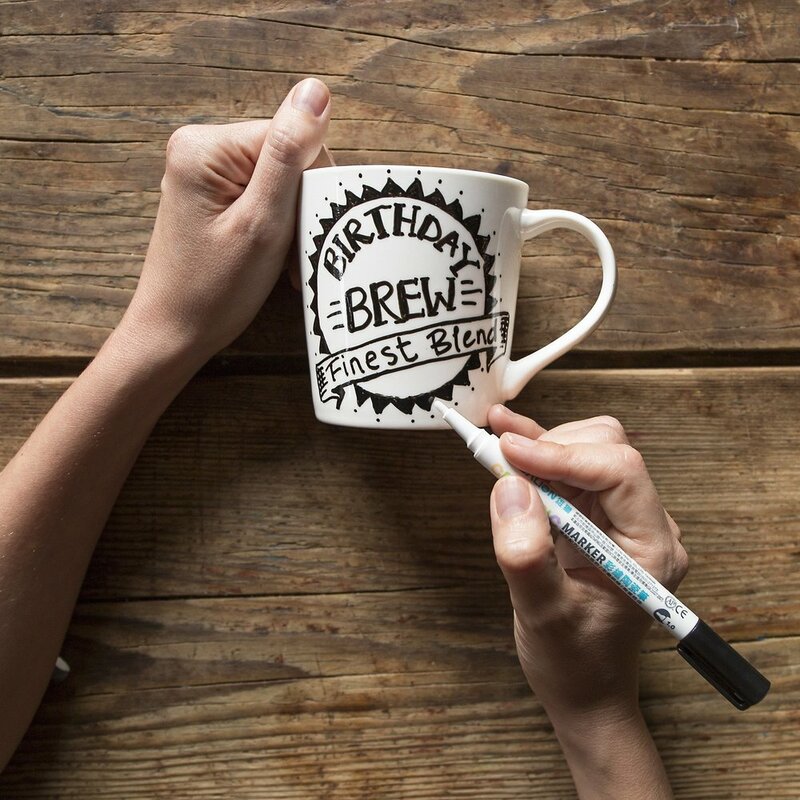 On the blank canvas of the doodle mug, you can get to work on creative customisation using a black wash-off marker pen. Practise your drawing, capture and organise your thoughts for the day ahead. The ink stays put until you wash it off with warm water and ordinary washing-up liquid. Just one of a number of ingenious gifts from Eat, Sleep, Doodle for those who love to make their mark. Looking for a gift that will win the approval of a child as well as their parents? London entrepreneurs, Tech Will Save Us, have come up with the answer with their ingenious range of toys that inspire creative play and visual thinking while introducing children to STEM concepts and coding. With the electro machines kit, over-4s can create whirring robots and zooming race cars from electro-conductive play-dough. So blooming clever. As lovers of a good visual gag, we rather like these sushi socks. Two perfect rolls of sock-based silliness, ideal for the sushi-loving sock-wearers in your life. They're available from the intriguing online shop of modern furniture makers, SCP, where you'll find something super-stylish to suit any budget. Forgive us the self promotion, but we're pretty excited to have our small online shop stocked with original Scriberian works of art, just in time for Christmas. If you follow us on social media you'll be familiar with the steady stream of sketchnoted wisdom that we've been producing in our studio. We've selected a few of our favourites from recent months, and put them in pride of place on our virtual shelves. They include this brilliant A3 poster of the legendary Woody Guthrie's New Year's Rulins. Written on the eve of 1943, Woody's vows range from remembering to brush his teeth, to doing his bit in the fight against fascism, and they are as stirring today as they were 75 years ago. Hurry up and place your order and our little elves will get it in the post in time for Christmas. Woody Guthrie's New Year Rulins, Scriberia, £20 + p&p. And, of course, how could we forget the ultimate stocking filler? The gift of drawing! How To Draw Anything, our debut publication is designed to help you discover, or rediscover, the joy of expressing yourself through pictures. Our step-by-step guide will turn even the most nervous doodler to accomplished visual communicator. We love it, and we think you'll love it, too. Happy drawing! 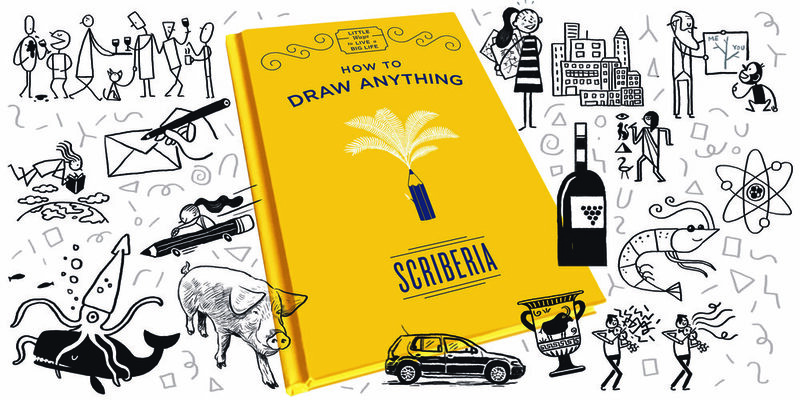 How to Draw Anything, by Scriberia, is available from all good book stores including Amazon, Waterstones, Foyles and others. Support your local independent bookseller by purchasing through Hive. And if you'd like to download a sample chapter of the book, it's available here!